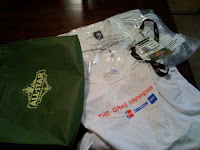 co-branded T-Shirt , non woven polypropylene bag and imprinted lanyard. "See even the NBA uses promotional products!" 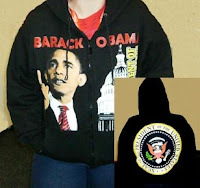 Have you found it a bit surreal the amount of Obama Swag that people are producing in order to gain some profit off of our newest president? I've seen a plethora of mugs, mouse pads & T-shirts in recent months and wondered how it could be legal to use the brand and logo of the president for profit. So I went to the Internet for answers and found an interesting article at http://www.time.com/ (click the image to read the article) that helped shed some light on the brand issue. Of course, there is an actual presidential seal and it's only allowed to be used legally for and by the presidential office for official presidential trinkets. All other swag is just a knock off, so beware if your investing in a piece of memorabilia that you hope will hold some value over time as a collectible. The Oscars and Sharpie SWAG...Really? It's Oscar season and across Los Angeles the Oscar Suites are at full capacity with celeb guests. 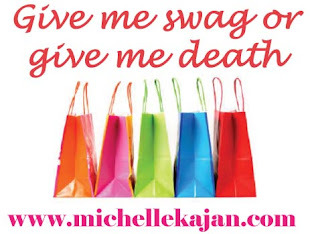 Celebs are picking up the usuals like, gift certificates for cosmetic surgery, jewelry, and other free swag. One of the lines I rep & one of my favorites, the often under appreciated and overlooked Sharpie unveiled a new product this Oscar season. Sharpie unveiled their new stainless steel version "The SS Sharpie!" The SS is this seasons blinged out MUST HAVE product, for the chic autograph signing celeb on Oscar's Red Carpet. Click the image of the SS to read all about the big debut and all the celebs that visited the Sharpie SWAG Suite. Take a note from this Juicy Couture project this is the perfect swag gift for any V-Day event or promotion. 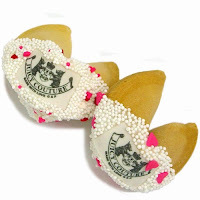 Lady Fortunes is known for their ability to logo their gourmet sweets, in the line you'll find the following: fortune cookies, Oreos, graham crackers, sugar cookies and biscotti! Yum! These delicious treats (& the fortune cookie in the image) are too amazing for words! 100% edible custom artwork- logo, text, design-is applied to each White Chocolate Hand-Dipped Gourmet Fortune Cookie. You choose the color sprinkles and can combine them to complement your image in a "picture perfect" way! You can even personalize the fortune inside of the cookie! -Call me for more details and exclusive pricing! Love is in the air this month... I love it whenever I see brands available to corporate out at retail. One of In Style's favorite Valentines Picks under $100.00 was this adorable little photo envelope by Graphic Images of New York. 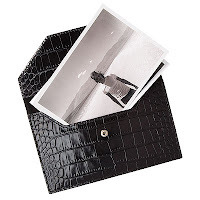 In Style suggests if your travelling to fill the photo envelope with snapshots of your honey so you're never far apart. Click the image to see this product and other favorite product picks by In Style. You could take this same idea and gift these swagable little photo envelopes to your clients with a discreet logo so your client will always remember this fantastic gift from your company.